Michael Leveritt conducts research in nutrition and exercise science which contributes to understanding how individuals and groups can make better food and nutrition choices to improve health and exercise performance. Michael Leveritt is a Senior Lecturer in Nutrition and Dietetics in the School of Human Movement Studies. He is an accredited practising dietitian and has a PhD in exercise physiology. 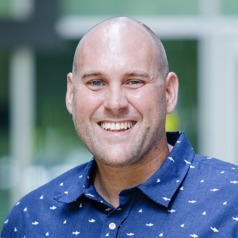 Michael is currently the program convenor for UQ’s Bachelor of Exercise and Nutrition Sciences degree and also teaches students in the Master of Dietetics Studies program. He has broad research interests covering nutrition and exercise science. He is particularly interested in understanding how nutrition and exercise training can be most effectively used to enhance sport and exercise performance. In addition, his research also contributes to understanding how individuals and groups with, or at risk of, chronic disease can be best supported by health professionals to make positive lifestyle behaviour changes. Michael has co-authored over 90 articles in peer-reviewed scientific journals and over 100 national and international conference abstracts. He is currently an Associate Editor for the European Journal of Sport Science.